Almyrida - A traditional Greek town on the warm coast of Crete. The village of Almyrida is a tiny little fishing hamlet situated just 40 minutes drive from the town of Chania. 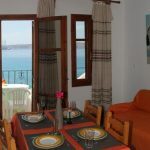 Almyrida or Almeritha is situated on the coast, with gently shelving sandy beaches and a small fishing harbour. The village is backed by olive and orange groves and the area is so untouched and charming that it was used for the filming of part of of “Zorba the Greek”. There isn’t much to do in the village but sit and relax in the select few bars and Taverna’s. The are a scattering of local gift shops and souvenir stalls where you can pick up local produce like wines, olive oil and the famous Cretan honey. Although the village is starting to get more tourists visiting it year on year, it has still retained that charm of a little fishing village and the locals still rely on the land and sea for their main income. What to do in Almyrida? You can settle in one of the local Taverna’s and watch the world go by, the restaurants here offer up some of the best Greek food you will ever try, with fish freshly caught on the day served up in mouthwatering Greek dishes. The prices are as low as you would expect when away from the hustle and bustle of major destinations, and always look to eat in the Taverna’s that the locals frequent for the best food. The bar owners in Almyrida will welcome you with open arms and you will find yourself returning night after night, to chat about Crete, local stories and world news. The longer you visit a bar in Almyrida means the more extra shots you get given to you, or the occasional free beer, this is Cretan hospitality at its best. Because the village was not built for tourists, there isn’t much to do apart from sunbathe and a little shopping so make sure you hire a car or bike and get exploring the wonderful countryside. If you want something more then you can always visit the town of Chania, and get some great shopping bargains, or spend the night in its many small clubs, bars and water front cafes. There are only a few hotels in the fishing village of Almyrida, they are very good quality and offer a very warm welcome to all guests. Don’t expect the hotels to be very crowed as the resort is still developing. 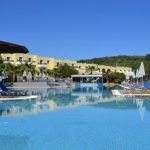 You can book hotels in Almyrida with Thomson holidays and Simply Travel. If you want a better view of Almyrida, then take a look at the video below, it only features Almeritha beach but gives you a brief idea of how quiet and peaceful this village is, if your wanting to book a holiday here.